Right before fashion week I decided to take my hair in a different direction – for the longest time I’ve always gone for a more warm, honey blonde but I’ve decided to be brave and test out a more icy blonde look. Since it’s so warm in Texas for most of the year, the honey blonde has worked and looked great (thanks, Monty!) since I’m also able to have a little color in my face (and thanks to you, Dr. Dennis Gross!). Albeit from a couple times in high school and at the beginning of college when I went darker (terrible idea… both times), I’ve been pretty modest with my hair choices. I envy ladies like Julia who have the courage to be more of a chameleon season to season with their tresses. She’s done everything from ombre, super blonde, auburn, dark brown, etc. She’s also fantastic at doing different braids, curls, and other ‘do’s every day (something else I need to work on). Year after year, my hair remains the same. This fall/winter I’m finally going to shake things up – I’ve already started with the color. Right before fashion week, my mane man Monty took me a little lighter and definitely incorporated more cool tones than before. I love it, but I want to take it even further, against the advice of my mother (sorry, Mom!). While I am going to try my hardest to just keep doing highlights vs an all-over color, I’m so tempted by the solid icy white shades of the models above. It’s just so much more striking, don’t you think? The problem is, once you go all-over it’s very difficult to get back to your natural color, should you want to go that route. What are your thoughts on the subject? Also, while I love my hair long, I’m getting a little bored with it. The last time I was at Osgood O’Neil, my new hair stylist said he thought I would look great with some fringe. I grew up with bangs (evidence here and here) and cut them myself freshman year of college (big mistake – always go to a professional). I don’t hate the idea since I want a change, but I’m not sure I have the guts to go directly to a full set of bangs (kinda love this look). I need help! Do you think I should keep my cut the way it is or go bold and try a little bit of a shorter ‘do? I always thought this was your natural color!! You are blonde aren’t you? I think to go a little icier would be great and I think maybe you could choose a long bob?! But I think a ponytail would not be your thing. But try something different. I’m the same, not daring much with my hair, do not even color it…but sometimes I think maybe it wouldn’t be that bad?! Oh, Merritt…that first cut (photos) and the icy blonde would look AMAZING on you!! It would give you the option of going even a little edgier when you wanted to (picturing your skinnies with the leather patches on the knees, a Balenciaga City for some color – I’m an addict…maybe a leather jacket, silk blouse and some tousled platinum bed-head with fringe). 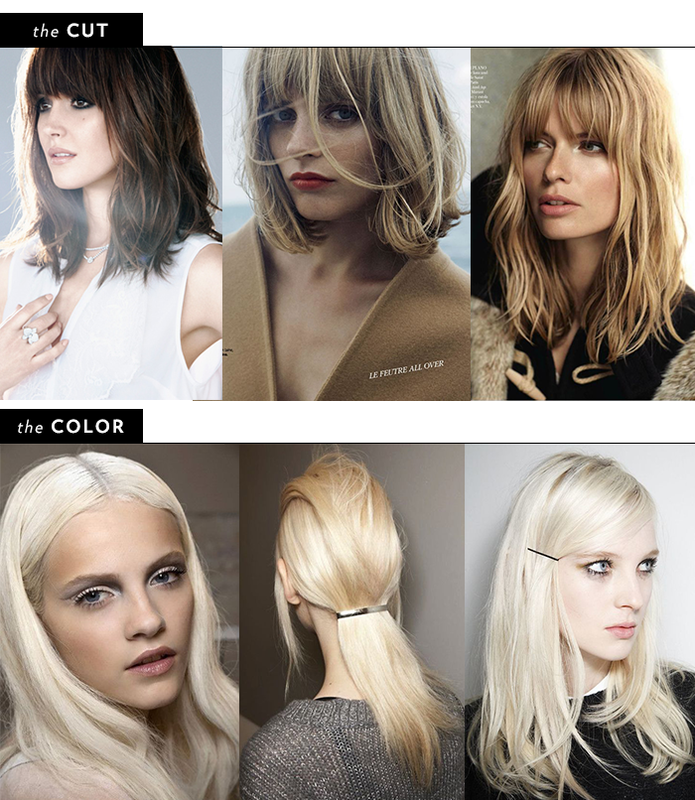 As for going back on the all over color, you can always add low-lights…. I’d do it in a heartbeat if I could pull it off but my skin tone isn’t right. Bangs would look cute on you!! I’m thinking of going icy blonde! Im so so nervous. I have never been blonde! But I love this inspiration pics. I just went icy blonde all over! It was certainly terrifying at first- I’m so used to highlights. But with the right toner at the salon and the right upkeep (Davines purple mask) it’s even better than I could have expected. Good luck and keep us posted!